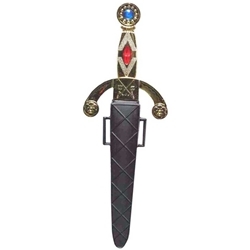 Plastic jeweled dagger studded with faux jewels. Includes black sheath case. Daggers have assorted gold or silver handles. Great for many periods: Elizabethan, Shakespearian, Victorian, Medieval and Rennaissance and Colonial and Civil War.